The Star Wars Battlefront II Alpha strikes again. After yesterday’s leaks, Reddit user uninspired_zebra managed to extract details on many of the heroes that will be featured in the game, including their weapons of choice and abilities. We learn that Yoda will be able to heal through the Force as well as absorbing blaster fire to then channel it into a wave of Force to damage and knock over his foes. Meanwhile, Lando Calrissian should become a favorite for those players who like to strike from a distance. The Battlefront II Alpha is still ongoing on PC, but there will be an Open Beta in the Fall for everyone to try. Star Wars Battlefront II will launch on November 17th for PC, PlayStation 4, and Xbox One. Boba Fett hunts his enemies by ambushing them with blinding concussion missiles and barrages of damaging wrist rockets, all the while staying constantly on the move with his jetpack. BOBA FETT’S EE-3: Produced by BlasTech Industries, and capable of firing a three round at the cost of accuracy. FOR THE HUNT: Enemies around Boba Fett are revealed for a short period of time. CONCUSSION ROCKET: Boba Fett fires a single concussion shot, dazing enemies caught in the blast. ROCKET BARRAGE: A hail of small rockets is launched from Boba Fett’s gauntlet. Han is a sharpshooter who quickly dispatches his enemies with the high power of his DL-44 blaster. He’s not afraid to charge into battle and finish the job with explosives if the going gets tough. HAN SOLO’S DL-44: Produced by BlasTech Industries, the DL-44 delivers high damage at the cost of overheating quickly. SHOULDER CHARGE: Han charges forwards, knocking over and damaging the first enemy he hits. SHARPSHOOTER: Han can fire the DL-44 rapidly for the next few seconds. DETONITE CHARGE: Han throws a sticky charge which can be detonated at will. LEIA’S DEFENDER PISTOL: The Defender sporting blaster pistol was made by the Drearian Defense Conglomerate. This low-powered weapon is easy to use and was popular in honor duels among nobility. Not sure on name: Leia swaps her blaster for her personal, enhanced E-11 assault, allowing her to blast her enemies with a stream of laser fire. SQUAD SHIELD: Leia deploys a squad sheild at her location. The shield protects her and those inside from blaster fire. CONCUSSION GRENADE: Leia throws a concussion grenade which detonates on impact, blinding and confusing enemies in the blast area. Luke uses his sabre skills and the force to be on the frontlines of battle. His high manuvourability enables him to rush his enemies and avoid damage. LUKE SKYWALKER’S LIGHTSABER: Based on schematics found in Obi-Wan Kenobi’s hutt on Tatooine. This lightsaber only uses one kyber crystal. FORCE RUSH: Luke uses the force to enhance his speed and quickly move in any direction. FORCE REPULSE: luke sends a burst of force enery out from the ground, dealing damage to any enemies nearby. FORCE PUSH: Luke uses the force to push enemies in front of him, knocking them over ledges or into danger. Bossk is a hunter, able to go on the offensive to root out his prey with choking Dioxis Gas or keep his distance and snipe from afar and protection his position with mines. BOSSK’S RELBY V-10: The Relby-v10 micro grenade launcher was a highly destructive blaster/mortar weapon modified from the BlasTech Industries CSPL-12 projectile launcher. It was commonly referred to simply as a Mortar Gun. PREDATOR INSTINCTS: Bossk loads in a round of high damage micro grenades and uses his Trandoshan instincts, gaining heat vision and enchancing his pysical strength. DIOXIS GRENADE: A thrown grenade which releases a potent cloud of dioxis gas that will damage enemies who stand within. PROXIMITY MINES: Bossk thows out 3 sticky mines that detonate on proximity trigger, healing high damage. Chewbacca uses his Bowcaster to fire charged shots at his enemies and his phycial strength to pummel and smash close targets. He is hardy enough to withstand even the most powerful attacks. CHEWBACCA’S BOWCASTER: A bowcasterwas a type of traditional and handcrafted projectile weapon commonly used by Wookiees. On the contrary to regular bowcaster, Chewbacca’s doesn’t fire enegized metal quarrels but pure energy. MULTI-SHOCK: Chewbacca throws a grenade which can be broken into a cluster of smaller missiles which electrocute enemies they hit. HEAVY SLAM: Chewbacca leaps and smashes his fists into the floor, dealing damage to enemies around him and knocking them off their feet. WOOKIEE BERSERKER: Chewbacca roars and overcharges his bowcaster, enabling him to fire fully charged shots with no charge time. Vader’s high survivability and powerful force powers enable him to stand on the frontlines and slowly advance on his enemies. DARTH VADER’S LIGHTSABER: Dual-phase lightsaber made after Darth Vader joined the dark side of the force. SABER THROW: Vader throws his lightsabre, cutting through and dealing damage to any enemies in the way. FORCE CHOKE: Vader chokes a cluster of enemies ahead of him, dragging them off the ground and through the air to drop them into danger. FOCUSED RAGE: Vader focusses his energies, allowing him to both deal and receive more damage. The emperor eliminates whole groups of enemies at a time using his powerful manipulation of the force to slow, stun and buffet them with force lightning. THE EMPEROR’S LIGHTNING: Force power firing electricity from the fingertips of the user. ELECTROCUTE: The Emperor electrocutes enemies in front of him, immobilizing them. DARK AURA: The emperor charges the air around him with force energy, damaging those around him and slowing their movement. CHAIN LIGHTNING: The emperor unleashes a burst of lightning which hits a target and spreads to those around them. GENERAL GRIEVOUS’S LIGHTSABERS: Lightsabers from the jedi General Grievous has slain. Kylo is a master of controlling his enemies with the force, freezing them or pulling them to him so that he can finish them with his aggressive light sabre attacks. KYLO REN’S LIGHTSABER: Crossguard lightsaber based on a ancient design from the Gret Scourge of Malachor. The lateral vents divert the extra power from this powerful weapon. FORCE PULL: Kylo uses the force to pul enemies ahead off their feet and towards him. FORCE FREEZE: Kylo freezes all enemies in front of him, immobilising them for a duration. SABER CHARGE: Kylo charges forwards and performs a spinning, 360 degree sabre attack when the ability button is pressed again. Maul uses his expert saber skills and aggressive Force powers to quickly assault and overrun the enemy, one at a time. DARTH MAUL’S LIGHTSABER: Darth Maul crafted his double-bladed lightsaber to exact vengeance upon the Jedi. SPIN ATTACK: Darth Maul goes into a high velocity lightsaber spin attack and leaps forwards. FURIOUS THROW: Darth Maul hurls his lightsaber, damaging all enemies it touches. CHOKE HOLD: Darth Maul chokes a few enemies and throws them to the ground. PHASMA’S F11D: The F-11D blaster rifle was a blaster rifle manufactured by Sonn-Blas Corporation. This ranged weapon was the successor of the older E-11 blaster rifle used by the Galactic Empire. Rey’s survivor instincts give her an expanded awareness of the battlefield which she uses to ambush her enemies and confuse them with mindtricks. Her saber skills allow her to finish them off up close. REY’S LIGHTSABER: Originally constructed by Anakin Skywalker, Rey found this lightsaber in Maz Kanata’s castle. INSIGHT: Rey senses her surroundings, revealing all nearby enemies to her. DASH STRIKE: Rey charges forward with her lightsaber, dealing damage to enemies on the way. MIND TRICK: Rey causes nearby enemies to be dazed and confused for a brief duration. Yoda is an expert at turning defence into attack, using the force to repel blaster fire, heal his wounds and protect him from harm while using his light sabre to inflict damage. YODA’S LIGHTSABER: Shoto-style lightsaber using a kyber crystal from the icy caverns of Ilum. 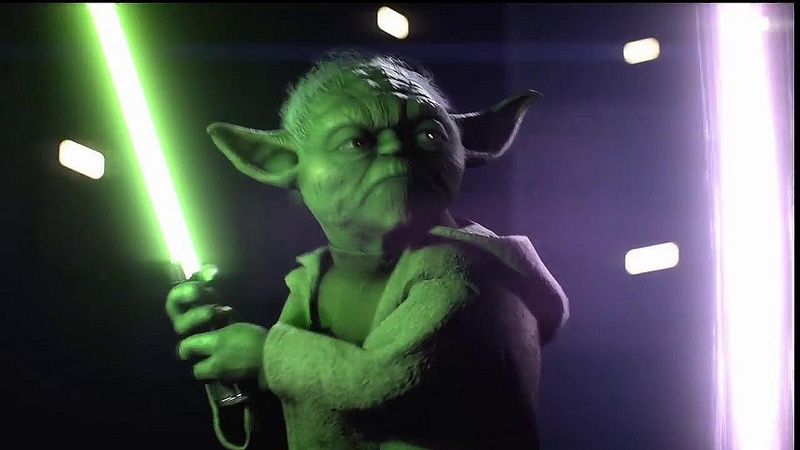 FORCE ABSORB: Yoda channels the force, absorbing blaster fire before channeling it into a wave of force power that can damage and knock over enemies. DASH ATTACK: Yoda leaps forwards, dealing damage to enemies he hits on the way. He cah perform the move 3 times in quick succession. Not sure on name: Yoda becomes one with the force, instantly removing any negative effects from him and healing him of his wounds. Lando uses cunning and gadgets to confuse and then ambush his opponents with his heat vision enabled X-8 Night Sniper pistol. You won’t see Lando if he sees you first. LANDO CALRISSIAN’S X-8 NIGHT SNIPER: The X-8 Night Sniper was a model of blaster pistol manufactured by BlasTech Industries that featured a computerized scope and silent mode. operation. SMOKE GRENADE: Lando throws a smoke grenade which obscures the view of his enemies. He can see them using his night vision capability. SHARP SHOT: Lando takes a moment to take focus on up to 5 enemies before delivering a flurry of headshots against each one. DISABLER: Lando throws out a sticky rebel device which disrupts the radars and communications of enemies around it, as well as revealing them through the environment. He can detonate the disabler at any time to shock eneimes around it.